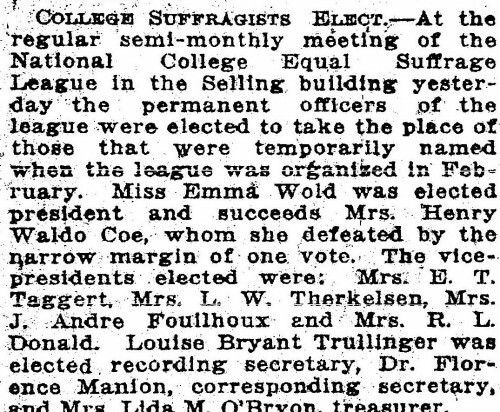 COLLEGE SUFFRAGISTS ELECT—At the regular semi-monthly meeting of the National College Equal Suffrage League in the Selling building yesterday the permanent officers of the league were elected to take the place of those that were temporarily named when the league was organized in February. Miss Emma Wold was elected president and succeeds Mrs. Henry Waldo Coe, whom she defeated by the narrow margin of one vote. The vice-presidents elected were: Mrs. E. T. Taggert, Mrs. L. W. Therkelsen, Mrs. J. Andre Fouilhoux and Mrs. R. L. Donald. Louise Bryant Trullinger was elected recording secretary, Dr. Florence Manion, corresponding secretary, and Mrs. Lida M. O’Bryon, treasurer. SOCIETY FOLK HEAR ANTI-VOTE SPEECH: Prominent Portland Women Attend Meeting to Denounce Fight for Ballot: ORGANIZED WORK STARTS: Miss I. T. Martin Declares Suffragists Are Afflicted with “Political Palpitation” and That Franchise is Not Privilege. Attended by a number of persons prominent in Portland’s upper circles, a meeting of anti-suffragists was held yesterday in the assembly-room of the Multnomah Hotel, where Miss I. T, Martin of New York, gave an address outlining her views in opposition to equal suffrage. The speaker was introduced by Mrs. Francis J. Bailey, president of the Association of Women Opposed to Equal Suffrage, under whose auspices the address was given. Prominent in the assemblage were: Mrs. Wallace McCamant, Mrs. H. W. Corbett, Mrs. J. S. Hamilton, Mrs. Herbert Holman, Mrs. Robert W. Lewis, Mrs. James Honeyman, Mrs. Alma D. Katz, Mrs. Hannah Robertson, Mrs. W. O. Van Schuyver, Miss Henrietta Failing and W. D. Wheelwright. 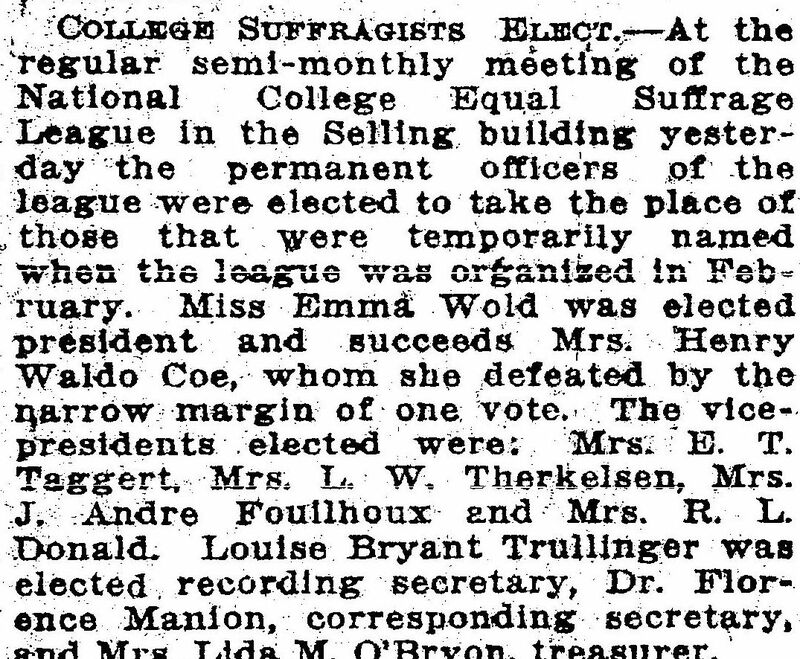 The announcement was made that at a meeting to be held Tuesday night in the ballroom of the Multnomah Hotel W. D. Wheelwright would be the principal speaker against equal suffrage. Miss Martin will again be heard at that time. Later she is to visit several of the larger towns of the state to disseminate an anti-suffrage sentiment among the voters. Miss Martin devoted much of her address to showing that in her opinion women’s participation in politics will not improve either political or social conditions. She gave Ida Tarbell, Kate Barnard, Emily P. Bissell and others as high types of anti-suffragists. The women who are most concerned about the ballot, the speaker said, are not declaring their views on the great questions of the day, such as the tariff, the trusts and conservation, but are concerning themselves about such nonpolitical questions as better milk, fresher eggs and “how to legislate tuberculosis out of the air.” Miss Martin Said she had learned that it was not proper to give instances of the effect of equal suffrage in Colorado, because women have not voted long enough to prove definitely what they could do. Miss Martin then gave numerous instances where women’s part in political affairs in Colorado was shown to be a detriment. She quoted Judge Lindsey, the famous Juvenile Court Judge and equal suffrage advocate, as saying that the leading suffragists of Denver are politicians just as the men are and that their election to office cannot be secured without the assistance of the corrupt machine. .
Not a Remedy for Social Evils. Further quoting Judge Lindsey Miss Martin said he had declared that a woman who had gone to other states and told of the great things he had done for equal suffrage had before that taken the platform against him. Miss Martin pointed out that in spite of the declarations of equal suffragists that the social evil will be eliminated through their use of the ballot this social blight is as prevalent in suffrage states as elsewhere. Vote a Duty, Not a Privilege. “We hear a great deal about the right to vote. We all know that there is no such thing as an inherent right to vote. Voting is a duty, not a privilege, and women have been exempted from this duty, and not deprived of a privilege. The obligation to vote carries with it other obligations—the righ to bear arms, if need be, to quell riots, to fight fires, to serve upon juries, to act as policemen. Women are absolved from these duties, just as they are absolved from the duty of voting. Now and then we are told that ‘taxation without representation is tyranny,’ and that women, exempted from the duties of voting, are living under a form of tyranny. Taxation has nothing to do with voting. We pay taxes for the protection of life and property, and who shall say that the minor or the non-resident taxpayer is living in a state of tyranny because he has no vote? Better work Awaits, She Says.